Home Costs > How Much Does Ceiling Fan Installation Cost? Ceiling fans are not easy to install, especially if you don’t have experience with electrical work. If you want to hire a professional, the price of one is going to greatly depend on the company, the complexity of the job, as well as the number of fans that need to be installed. “New Ceiling Fan” (CC BY-SA 2.0) by amboo who? How much does a ceiling fan install cost? On average, most electricians are going to charge anywhere from $75 to $220 to install a ceiling fan in an existing lightbox. If there is a light already in place where you want to place a ceiling fan, the electrician can simply take out the old light and replace it with a fan of your choice. If the wiring isn’t there and a new junction box needs to be installed, then the prices can go up. If wiring is needed as well as a new outlet box, the cost can be anywhere from $175 to as much as $350 depending on the complexity of the job such as the height of the ceiling, if you have an attic access and where the wall switch is located. Don’t be surprised if the quote surpasses this price range if the job was deemed to be too difficult. Many major home improvement stores such as Home Depot and Lowe’s will run ceiling fan installation specials that can range from $75 to $120 when you purchase a fan through them. This price will only be good for jobs where a ceiling fan simply needs to be replaced. According to the website TheHousingForum.com, they claim that it would cost upwards of $150 to have a professional installation done if there was already a light outlet installed. For those who want to do it yourself, the costs should be within the $100 range. During the job, an electrician will be able to assemble the fans as well as layout the appropriate framework if a new box has to be installed. He or she will then be able to replace the older light fixture with a new ceiling fan in the area of your choice. A professional will usually take up to two hours to install one fan; however, it could be a pinch more if they had to run wires. If the lightbox hasn’t been installed, the contractor will more than likely have to run the wire through the attic access, connecting the wires to a circuit breaker box. Of course, the ceiling fan will be an additional expense to factor in, and depending on the size, decor, mount type and where you purchase it, the average ceiling fan can cost anywhere from $45 to $85 for the most basic model to as much as $350 for a higher-end ceiling fan made of quality materials with a remote control. Additional parts may be needed on the job such as electrical boxes or light switches, which can be charged extra. If you want a remote for your fan, many brands have remotes that are sold separately. Ceiling fan remotes can cost anywhere from $25 to $60. If the junction box attached to the ceiling needs to be reinforced or replaced, this may cost an additional $20 to $40 to replace it. If a lightbox hasn’t been installed and the contractor has to install a new light box and run wires, the costs can be significantly more. Other complexities, such as no attic access, high ceilings and no local wiring above the ceiling, can add to the total cost. Most states won’t require a permit if the light is simply being replaced; however, if a light is being added to a newer location, then a new permit may be required, depending on the state you live in. If required, the permit should cost about $50 to $150. Most electricians will cut a deal when you have more than one fan that needs to be installed. 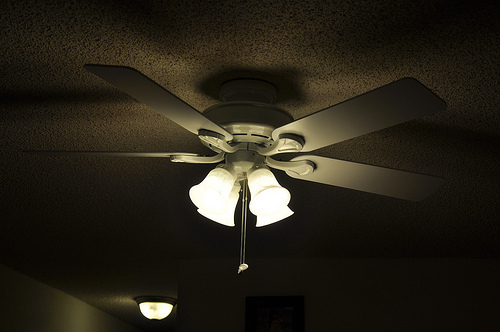 Count on getting all your fans or light fixtures done at once to save the most money. Consider purchasing your fans through a store such as Home Depot to get a special ceiling fan installation deal. There are many times when you’ll find these fans not only on sale, but you can also receive rebates for your purchase and more. If you plan on hiring a professional, consider getting multiple quotes for free from HomeAdvisor.com. Here, you simply explain your job and licensed and insured contractors will be able to give you an estimate. Don’t always choose an electrician based on the price. Always make sure they are licensed, insured and are up to date with their credentials. In the age of the Internet, most of this information can easily be found by searching your local state’s license database. Even if they are licensed and insured, look at their reviews to see what other people are saying.